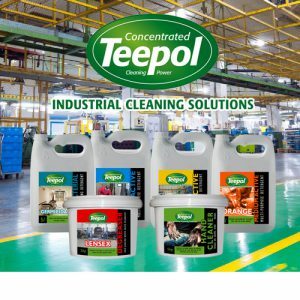 The Teepol Industrial range has an established reputation for quality, efficiency and value across its full range of Detergents, Degreasers and Disinfectants. For many years these products have been trusted by corporate customers in manufacturing, mining, industry, construction, agriculture, health-care and government organisations. Teepol products were developed by Shell Chemicals and registered here in 1944. Acorn Products acquired the Teepol brand from Shell in the early 1990’s. Domestic Teepol products such as Dishwashing Liquid and Multi-Purpose household detergent are distributed throughout South Africa and can be found in major retailers and wholesalers everywhere.